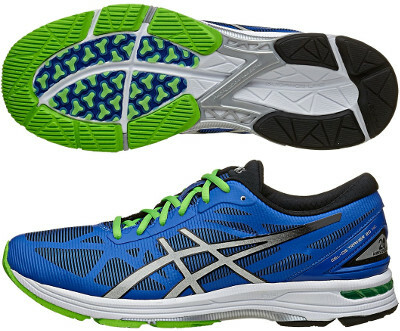 Asics Gel DS Trainer 20 are stability performance running shoes. In the 20th edition of one of the most popular performance running shoes with pronation support, the Asics Gel DS Trainer 20 is the lightest DS trainer ever and also features a vintage look which will be highly appreciated for big fans. A running shoe that fits perfect for both daily trainings and racing. Extra layers have been removed in the upper for better breathability and seamless construction targets irritation reduction. New exoskeletal heel counter provides improved support combined with DuoMax® dual density midsole and redesigned TPU unit (Propulsion Trusstic®) in the midfoot for an enhanced response. Weight reduction (around 10%) from its predecessor the Asics Gel DS Trainer 19 has been done by the lighter evolution of the Solyte® midsole which delivers perfect blend of responsiveness and cushioning along with well known rear and forefoot GEL®. Outsole has been reconfigured keeping flexibility and lightweight in mind without forgetting traction and durability. It mixes the flexible DuoSole® (the "DS" in the name stands for "Duo Sole") with AHAR placed in critical areas for exceptional durability.